Use Direct Ferries to compare and book your Ferry to Trieste in Italy to get the best deal. Using our fare search you can check timetables, live prices and availability for Ferries to Trieste, or compare your destination with alternative ports, not just in Italy, but further afield too. 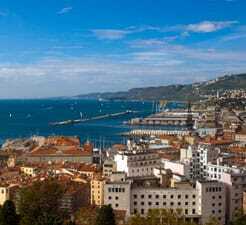 It really is simple to save on your ferry to Trieste with directferries.co.uk. All you have to do is select your place of departure, ferry route, number of people travelling on the ferry to Trieste and hit the search button. dirty ship, no one was caring about the cleaning on board. Rude staff at the bar. Air conditioning not working. Ship not big enough for all those people. I booked with this company just because it was the only operator for my return from Greece. Igoumenitsa Trieste and back. ship on time, staff very friendly and helpful, ship very clean, food was good but expensive. Very pleasant crossings, everything OK.
"Everything except the food mediocrity, that's awful ... "
All in all OK. The stopover in Ancona costs about 2 hours. From here the ferry takes another 6 hours to Trieste. The food in the restaurant, canteen and bistro on the ship is incredibly bad and this of course is not all that cheap. This one gets dished out on an Italian ship the worst possible pizza is amazing. Coffee and other drinks are good but expensive. Only 30 minutes late for a ferry on the Adriatic quite ok.
"Hygiene fails to dog owners "